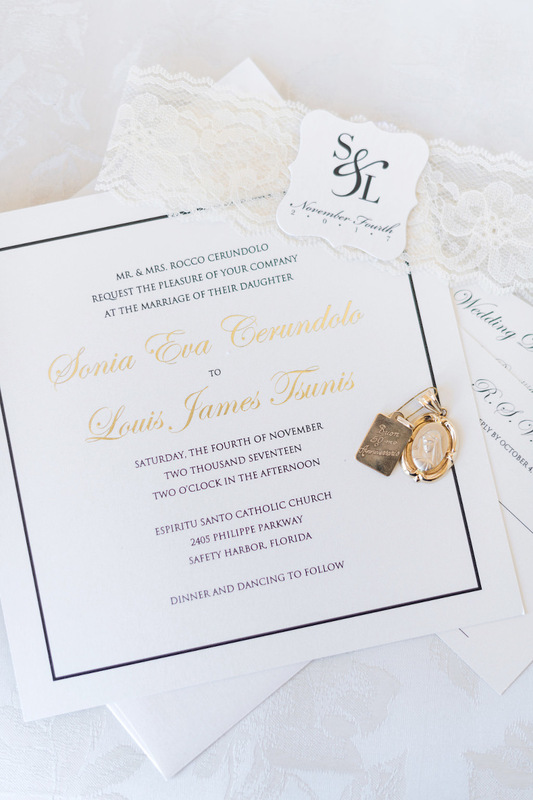 Sonia and LJ’s downtown St. Pete wedding featured a classic and elegant ambiance, with a gold, blush, cream and rose gold color palette. Incorporating family tradition was important to the bride and groom, who had a 200+ person guest list. 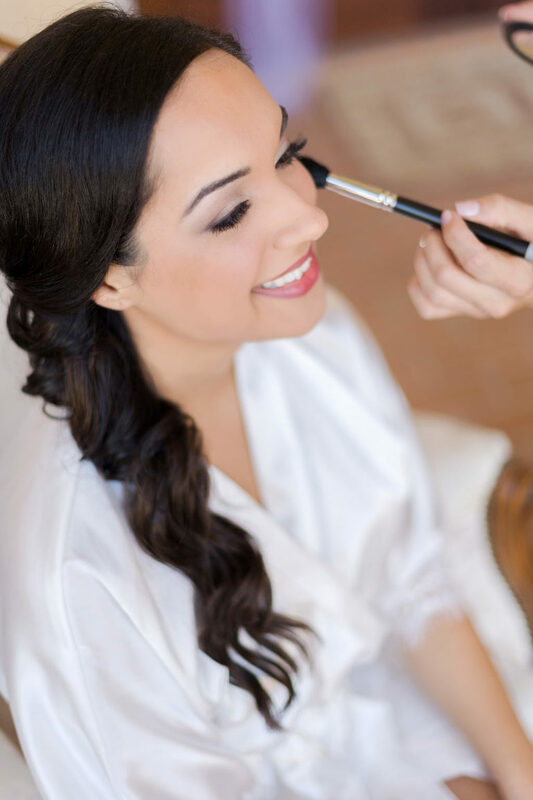 For this gorgeous brunette bride, she knew that she needed an amazing hair and makeup team, so she turned to Tampa Bay beauty experts Michele Renee the Studio for hair and LDM Beauty Group for makeup. 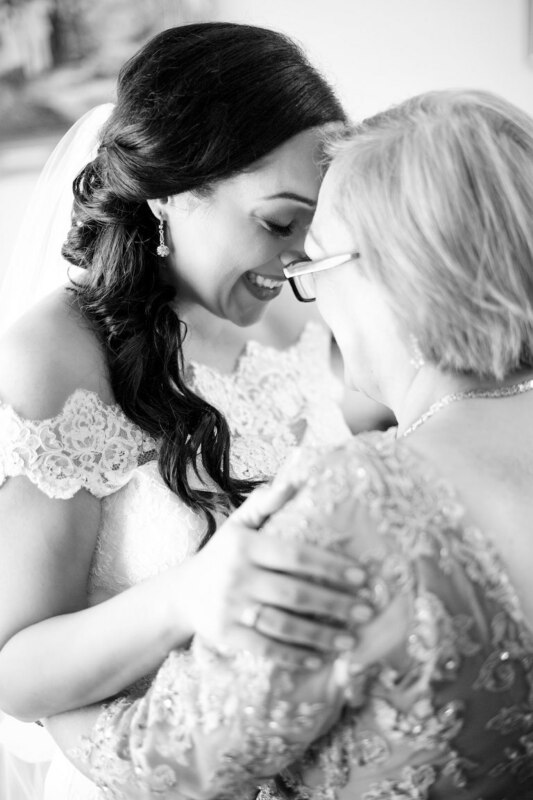 Looking back on their wedding day, the bride reflected that some of her most cherished memories were shared simply with the groom. “The exchanging of our vows was the moment it all came to life. The limo ride from the church to the Vinoy was also memorable. We decided to have the limo to ourselves while our bridal party was in a separate vehicle. It was important for us to have some time alone to digest the first half (ceremony) of our day. We also knew the next four hours would be fun-filled but crazy, so a little quiet time to decompress was nice,” the bride reminisced. What did you look for in a wedding hair and makeup team? Reputation and reviews helped a great deal in making my selection. I spoke with some other brides in my circle of friends, as well to see who they had used. I had used Michele Renee The Studio for another wedding I was in years ago as a bridesmaid and hired them to do my hair. LDM Beauty Group came to the rescue at the 11th hour when our engagement shoot got canceled and then rescheduled. Lindsay came to my house at 5 a.m, on a Sunday. She was awesome and fabulous, so it was a no-brainer that I would hire her for the wedding. L.J. proposed on the Riverwalk by Ulele. That place held some memories of when we first started dating. The Sunday he proposed was right before the Super Bowl and his beloved New York Giants were playing. I had an inkling that a proposal was coming sooner than later, but was absolutely certain it wouldn’t be that day in the middle of the game. Safe to say he caught me by surprise! It was a beautiful spot. He even had a photographer on-site incognito. I wanted a very classic and elegant look for our wedding. 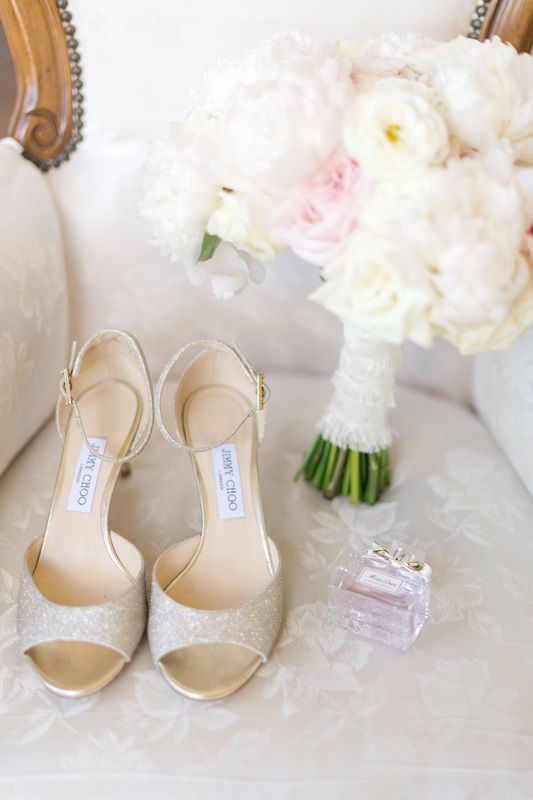 The color palette was gold, blush, cream/ivory and rose gold. I wanted us to be able to look back on our wedding day photos decades from now and see a timeless look. We incorporated our personalities in the food, grilled cheese with tomato soup for a late night station (This is our favorite go-to meal at home). As well as some of the other elements music, a mix of dance music and some old school Italian tunes. My husband isn’t into desserts but loves cheesecake, so I got him a giant cheesecake for the groom’s cake. It was a dream for LJ, designed with all three of his New York teams: Islanders, Giants, and Yankees. Don’t put things off, because you will always have last minute details to tackle, so do what you can ahead of time. Get that date and venue nailed down ASAP. Wedding planning is fun, but can get a little intense. Every once in a while we had to ban wedding talk for a couple of hours just so we could go back to being Sonia & L.J., not the bride and groom. It’s important to remember that it’s one day. Yes, we all want it to be perfect and beautiful, and it will be, but this day is the start of every day with your spouse. Don’t let all of the outside factors cloud the true meaning of what you are preparing for.